The ABL1 protooncogene encodes a cytoplasmic and nuclear protein tyrosine kinase that has been implicated in processes of cell differentiation, cell division, cell adhesion, and stress response. Activity of c-Abl protein is negatively regulated by its SH3 domain, and deletion of the SH3 domain turns ABL1 into an oncogene. 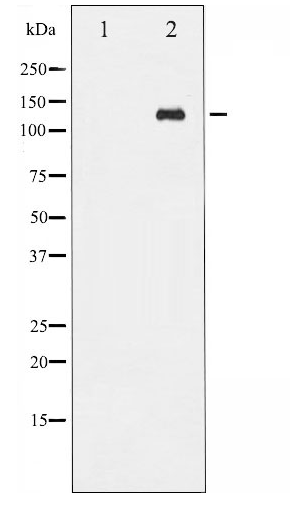 Western blot analysis of Abl phosphorylation expression in Adriamycin treated COS7 whole cell lysates, The lane on the left is treated with the antigen-specific peptide.